Yep, that's it. That's my breakfast recipe. Two oranges and some ice cubes. Like most raw foods, I'm finding that these foods are so delicious they can be very simply prepared. This morning, I though this looked like sunshine. 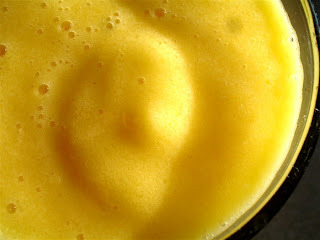 Blend the two peeled and sectioned oranges until very smooth. Add ice and puree. Kristen Suzanne is a raw chef, blogger, author and teacher who helps people succeed with their raw vegan lifestyles. Kristen is currently sharing her high raw pregnancy journey on her wonderful blog and even more information can be found on Kristen's website ... & you'll find some truly awesome ebooks there. She's been generous enough to share a few recipes here. 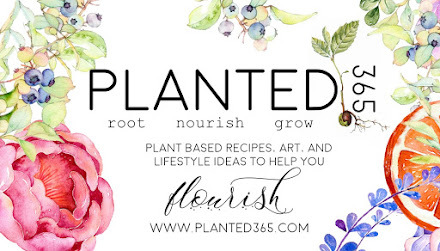 Her blog and website are both entertaining and helpful. I've followed her blog for more than a year and Kristen always has something helpful or yummy or even profound to share. This could very well be the most perfect raw soup ever. 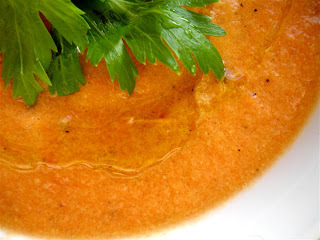 It has everything in it and it's so delicious ... creamy and savory, just a little warm. Yum. 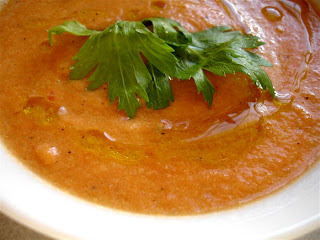 This recipe makes about six cups of soup which today served three perfectly. I've definitely added this to my short list of recipes I know I'll use over and over again. 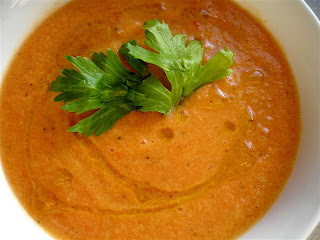 Blend all ingredients, except for the oil, until very smooth and creamy. Add in oil and blend for another minute or so. Enjoy. Oh, and I drizzled a half teaspoon of oil over top of each just because it looks pretty. "In a food processor, fitted with an "S" blade, combine all of the ingredients except the olive oil, adding a little of the sun-dried tomato "soak" water, if necessary. While the mixture is pureeing, add the olive oil. Enjoy!" 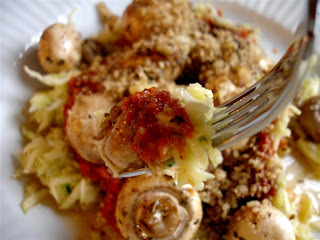 Kristen's versatile sauce is so easy to enjoy. I served it with marinated mushrooms and onions over zucchini pasta. Clean the mushrooms, but leave them whole. Finely chop the onion. Mix together the oil, agave, garlic, basil, salt and pepper and pour over the mushrooms and onions. I do this in a zip lock type box, but a glass bowl would work was well. Allow to marinate for a few hours or overnight. Then, to warm, place in the dehydrator for an hour or so. Serve the pesto and mushrooms over zucchini noodles, using one small zucchini ($.59) per serving. Also, I've used agave as the sweetener here. I'm currently in search of the perfect raw sweetener because I have ethical concerns about honey. But I react to agave a bit like I do to corn syrup. And that is not a good thing. Stevia has given me stomach aches in the past and is linked to possible liver damage in some people. Maple syrup isn't raw and has such a strong flavor. I'm thinking of just using evaporated cane juice, although it's not raw. Any thoughts? What's your favorite raw and/or non-raw sweetener? To make these even more tasty, and for about $.10 a teaspoon, top with a teaspoon or two of this nut Parmesan. Grind to a fine powder in the food processor. Avoid over processing as it will cause the nuts to become oily. This will keep for a couple weeks in the fridge. 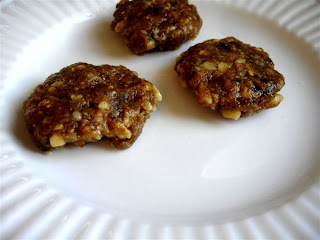 "... might substitute the pine nuts for hemp or cashews or walnuts. Your reader can make their own sun-dried tomatoes to save money, too, if they have a dehydrator. 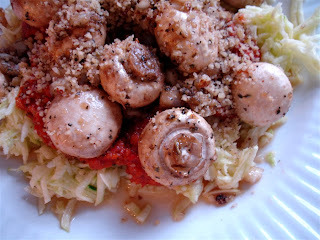 This can be served on spiralized zucchini pasta." And finally, this dessert is another fabulous recipe from the lovely Kristen Suzanne. 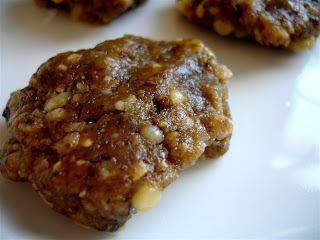 These cookies are banana nuttiness at its finest and use dried bananas in place of the dates or raisins we're used to. It's an ingenious idea, but so very simple and easy to make, too. Homemade banana slices are easy and economical, too. Just be careful of over drying the bananas like I did the first time around. The banana slices need to be leathery but not hard to blend well in the food processor. "Place the walnuts, salt, cinnamon, and nutmeg in a food processor fitted with the "S" blade and process to a coarse grind. Add the dehydrated banana slices and process until they're broken down and incorporated. As that is happening, add the raw agave nectar. Process the mixture until you get a dough-like consistency. 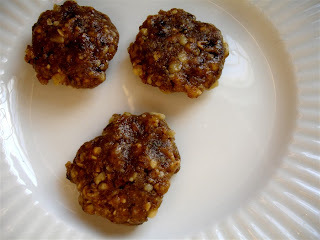 Form into small cookies, (either flat as shown in the picture or in balls). Enjoy!" To make homemade dehydrated banana slices, just slice bananas and dry in the dehydrator. These won't be like the hard as a rock slices you can find in the store. They will be leathery and chewy, and even hard if you let them dry long enough. But they won't have the artificial look and brittleness of store bought. Nuts have growth inhibiting enzymes on them. All dried nuts or seeds do. This makes perfect sense. A nut or seed is the part of the plant that will spout and grow into a new plant. This needs to happen under the right conditions, though, or the new plant would quickly die. But, it makes nuts and seeds more difficult for us to digest. Right conditions for life as we know it always includes water. So, the growth inhibitors can be neutralized by soaking nuts and seeds in water for several hours. The optimal timing will vary for each kind of nut and seed, but about 8 hours is a good rule of thumb. 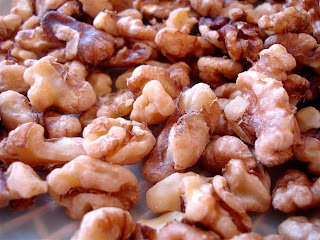 Soaking will not only neutralize the growth inhibitors, but also wash away the bitter tannins and result in a much better tasting nut or seed. 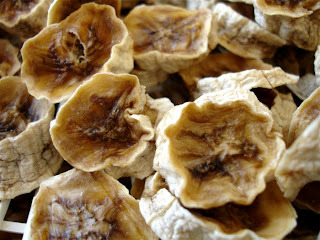 Soak nuts or seeds for about 8 hours and then spread out and dry for several hours in a dehydrator. evaporated cane juice is sugar...double speak for plain old cane sugar. I hate that the "health" industry uses such BS terms. a little most likely won't hurt you. I'm lucky to simply not have a sweet tooth at all so I rarely use any and when I do I simply don't sweat it because it's so little...whatever it is I use. That's a winner of a day! I currently use agave, maple syrup and honey. I have also used something called zylosweet which by the name of it can't be anything natural (read more about it on Kate Wood's Raw Living site. I don't know if you saw how my first RAW SATURDAY went (I made your entire menu that day) but it was amazing! Can't wait for week 2. Just found your blog. Love the recipes. antony ... wow, kate woods is amazing ... i want to get her and shazzie's book "ecstatic beings"
I just want to comment and say that this is one of the most brilliant blog ideas I have ever come across. I linked your blog to my You Tube account as a blog recommendation for raw food so others could share these blog blessings as well. I don't eat fancy raw foods (I do simple to mono raw meals) but enjoyed viewing this. Gratitude to you and all the beauty you are creating! God bless you well! People call it raw, but it's described as kettle-boiled, so I believe it's not completely 100% uncooked. Since I use so little and nutritionally it's WAY better than most sweeteners, I'm happy with it. Plus it tastes a bit like light brown sugar which is awesome. Just popping in here to say thanks for your fabulous blog. 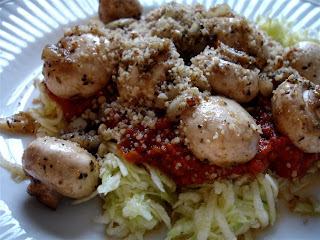 I'm new to raw, but loving it, and even more so when I see tempting foods like you show here, which can be made without breaking the bank or spending all day in the kitchen. The mango salsa got thumbs up from my meat-and-potatoes husb and even my dau. 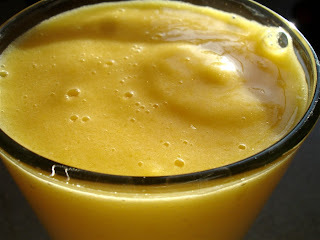 I'm having a sunshine smoothie this morning, except I added a bunch of carrots and a splash of vanilla for a sunshine creamsicle!